The Target Sports ASU are organising an inter-troop air rifle Shooting competition. Closing date for entries is the 23rd June 2019.
three 5 Bull targets using PCP air rifle, 1 shot at each bull. three 5 Bull targets using springer air rifle, 1 shot at each bull. Teams must complete shooting all of their targets within 2 hours. The top 2 scores of each team member for each rifle type will count towards the team score. all team members must be at least 10 years old and under 14 years 6 months. If a Troop is unable to provide a full team of 6, then (with sufficent notice) we may be able to find additional participants to support your Troop. Teams will be allocated to session/lanes on either the Saturday ( if we get more than 12 teams the competition will be extended into Sunday) in which their team will be due to shoot. The entrance fee is based on £7.50 per team member. Therefore, minimum team entrance fee is £30 (i.e. team of 4) and maximum entrance fee is £45 (i.e. team of 6). All participants must bring a Permission to Shoot Form completed and signed by their parent/guardian/carer, this is a LEGAL requirement. .
*Note: there is an option when completing the online form to specify a specific location or a time period. If a parent has already provided a Permission form earlier this year (from an open shoot event for example) covering the period of the competition they do not need to provide another. Scout Shirt and necker must be worn for the presentation ceremony. All team members will receive a Mersey Weaver District Certificate of Participation which can be used as proof of completion of part of the Master-at- Arms badge requirements. 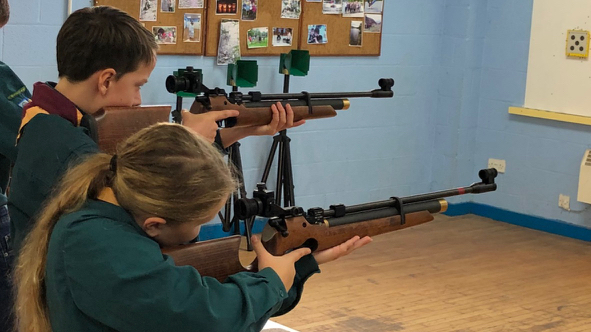 The top shooters from the event will be invited to the training sessions from which the District team for the Cheshire District Shooting Competition will be selected. However, a number of places on the practice sessions will also be open to any Scout or Explorer on a first come-first-serve basis. The County inter-district competition which will be held on the 16th November 2018 at Milldale Camp Site.